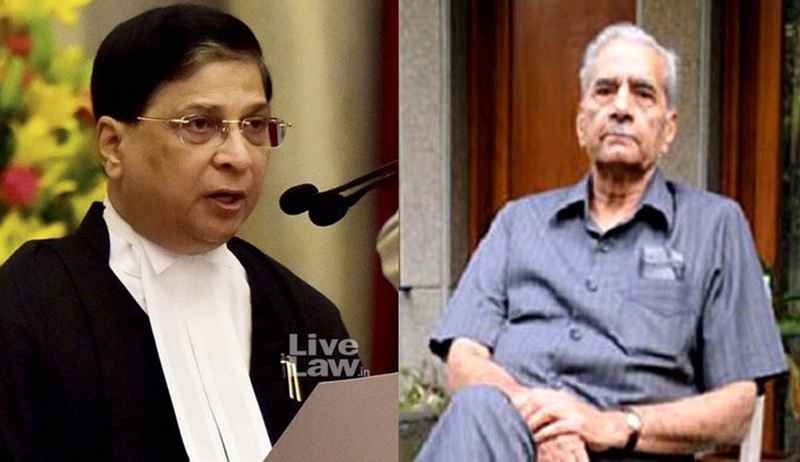 Amidst all the noise about “unfair listing of cases” and benches being handpicked for certain cases which reached its highest decibel with the unprecedented Press conference by the rebel judges, Former Law Minister and senior advocate Shanti Bhushan has filed a petition seeking clarification of administrative authority of the Chief Justice of India as the master of roster and for laying down of procedures to be followed in preparing the roster for allocation of cases which should be by a collegium of five judges to check the “unguided and unbridled discretionary power” of the Chief Justice as the Master of Roster. The petition, Mr Bhushan says, has been filed to check the abuse of powers of CJI in assigning cases or constituting benches. The words ‘Chief Justice of India’ must be deemed to mean a collegium of 5 senior judges of this Hon’ble Court. holding and declaring that the consultation by the Registry Officials for listing purposes, if any with the Hon’ble Chief Justice of India must include consultation with such number of senior-most judges as this Hon’ble Court may fix in the interest of justice. prohibiting the Hon’ble Chief Justice of India and concerned respondents from listing any matter contrary to the Supreme Court Rules, 2013 and Handbook on Practice and Procedure and Office Procedure or picking and choosing Benches for the purpose of listing contrary thereto, with the above modification of replacing ‘Chief Justice of India’ with the collegium of 5 senior most judges of this Hon’ble Court. That this Hon’ble Court may clarify that when matters are mentioned for urgent hearing/listing, only a date/time of hearing would be fixed but the bench to hear the matter would be determined in accordance with the Rules. Mr Bhushan says in the petition that the “authority vested in the Chief Justice of India must necessarily be exercised by him in consultation with the senior judges of the Supreme Court in keeping with the various pronouncement of this Hon’ble Court. It is to be noted that a roster declares what work is assigned to High Court and Supreme Court judges. The petition raised serious questions relating to the functioning of the Registry of the Supreme Court and the powers exercised by the CJI in “listing matters” as it said matters of general public importance and/or of political sensitivity are listed before only certain Benches contrary to the Supreme Court Rules, Handbook of procedure and conventions. “…in recent months there have been number of instances in which such powers have been exercised with legal malice by abusing the administrative authority conferred under the Constitution, the Rules, the Handbook of Procedure and the convention on the concerned Respondents,” said the petition. Mr Bhushan says the powers being exercised by the CJI and the concerned Registry officials clearly reflect a pattern of favouritism, nepotism and forum shopping. It is to be noted that Dipak Misra was appointed as Chief Justice of India on 28th August 2017. On February 1st, 2018 “Roster of the Work for Fresh Cases” came to be notified by the Registry under the orders of the CJI. The Roster was to be effective from February 5th, 2018 till further orders. Under the said roster all “letter petitions and PIL matters” have been arrogated by the CJI to himself along with “criminal matters”. “Criminal matters” are also assigned to Court numbers 2, 3, 5, 6, 8, and 10. Similarly “land acquisition and requisition matters” are assigned several Courts including Court numbers 2, 4, and 10. Service matters are also assigned in similar manner to Court numbers 4, 5, 8, and 10. The petition cites certain cases which it syas shows unfair allocation and handling of sensitive cases. The petition titled Campaign for Judicial Accountability and Reforms v UOI & Anr. seeking SIT investigation into allegations in CBI FIR relating to conspiracy to bribe in order to obtain a favourable judgment in the case of a Medical College, was given to a particular bench leaving out Justice Chelameswar and disposed of with cost of Rs 25 lakh. A review petition was filed in January but is yet to be listed. The matter of Common Cause v Union of India challenging the appointment of the Special Director CBI was listed on November 13, 2017 when this bench comprising Justice Ranjan Gogoi and .Justice Navin Sinha ordered that it be listed before another bench on November 17. On said day, matter was listed before Justice R. K Agrawal and Justice Abhay Manohar Sapre in complete contravention of Supreme Court Handbook on Practice and Procedure when it ought to have been listed before Justice Gogoi. Civil Appeal No.10660/2010 Centre for Public Interest Litigation v Union of India. (The 2G case) -- This matter came up before Court Number 2 on November 1, 2017 and was to come up on November 6 then. However, it was deleted and upon mentioning ordered for listing before appropriate Bench as per roster. The matter was thereafter listed before Court No. 1 and upon recusal by Justice A. M Khanwilkar and Justice D Y Chandrachud, it was placed before the Bench presided by Justice Arun Mishra even though other Benches of senior Hon'ble Judges were available. Subramanian Swamy v Delhi Police through Commissioner of Police (Involving the M.P. Shashi Tharoor) -- The matter was listed before Court No. 10 on 29.01.2018 and adjourned to satisfy on maintainability. Subsequently, on 23.02.2018, the Bench issued notice keeping the question of maintainability open. Special Leave to Appeal (Criminal) No. 1836 of 2018 Rohini Singh v State of Gujarat -- This matter involving Jay Shah, son of Amit Shah was also listed before Court No. 1 while several other courts have been authorized to hear criminal matters under the Roster. Mr Bhushan’s petition also cites the Aadhar petition of 2012 which was initially before a Bench presided by Justice Chelameswar but finally the bench was reconstituted twice and Justice Chelameswar, Justice Bobde and Justice Nazeer were kept out. Even the challenge to the appointment of BJP spokesperson Sambit patra as an independent director, ONGC was first listed before Justice R.K. Aggarwal and Justice Manohar Sapre on 04.01.2018 when they adjourned the matter to 08.01.2018. On said date, one of the judges recused. The matter was thereafter listed before Justice A.K. Sikri and Ashok Bhushan in Court 6. “These are some of the instances of clear abuse of power of listing matters and/or re-constituting Benches and assigning matters to such Benches completely contrary to the Rules and the Handbook of Procedure. If these Rules and Procedure prescribed were to apply, such listings and re-allocation of matters could not and ought not to have taken place. “The pattern also suggests that certain matters which are politically sensitive and involve either Ruling Party Leaders and/or Opposition Party Leaders are assigned only to certain Hon’ble Benches. Although appearing to be “routine”, these listing and/or allocations are clearly designed in a particular direction so as to exclude other Hon’ble Benches from hearing such politically sensitive matters,” says Mr Bhushan in his petition.